Fun Homemade Hot Chocolate with Mix-ins makes a cozy addition to the holiday season. Creamy hot chocolate made with milk, cocoa powder and sugar. Serve with flavor mix-ins and pair with chocolatey biscuits. November officially marks the holiday season for me. It’s the time of year when fall recipes are in full effect—comforting, cozy and decadent. Thanksgiving is no exception for enjoying these delicious foods. Every year I’ve shared this holiday with my parents and family. A recent new tradition I’ve enjoyed as an adult is Friendsgiving. This is an excuse to have an additional grand meal with those you care about, before or after the official holiday. Last year’s Friendsgiving was my first attempt at cooking a whole brined turkey. It was surprising success and most likely will become a new tradition. Another fun tradition I’m looking forward is DIY Hot Chocolate Mix-ins, made with homemade hot chocolate. 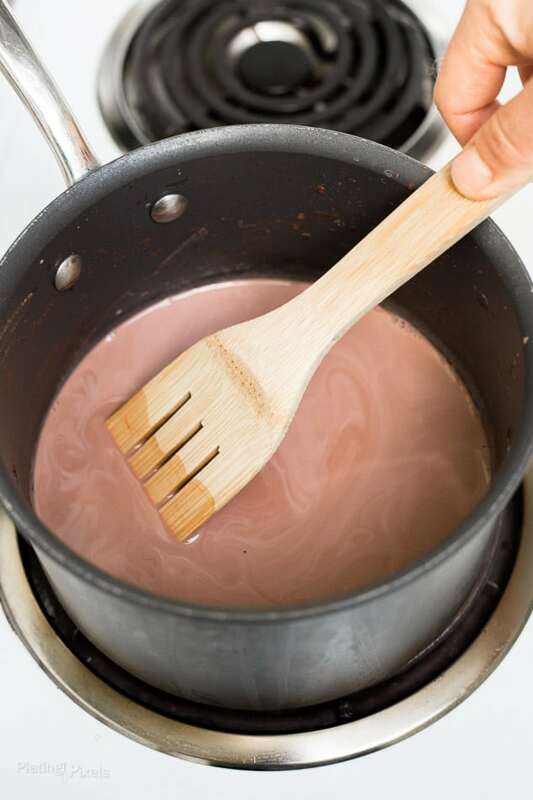 This hot chocolate recipe is simple as heating milk, cocoa powder and sugar. For a richer, creamier hot chocolate, substitute some half-and-half. Hot chocolate is of course wonderful on it’s own, but even better enjoyed with flavor mix-ins. Some of my favorites are any combination of candied orange peel or fresh orange zest, vanilla extract, cayenne powder, black pepper and sea salt. You can also add candied ginger, caramel, peppermint or almond extract to name a few. 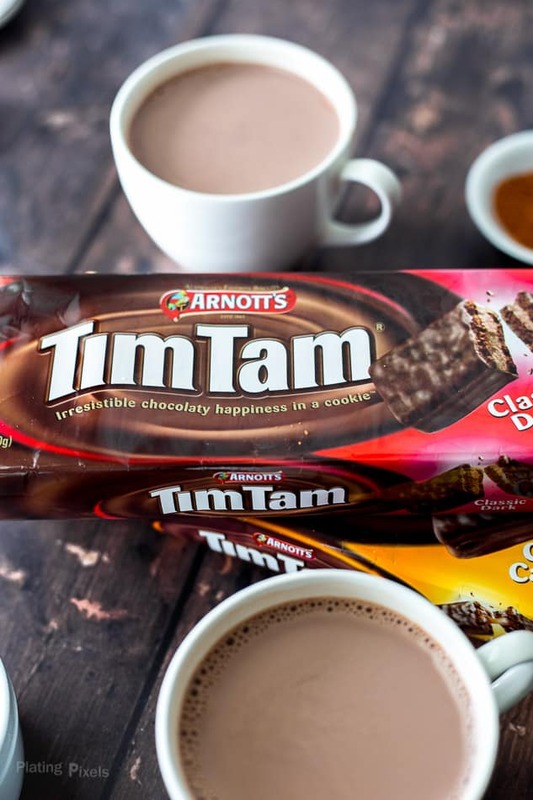 To go with the decadent drink, try pairing it with Tim Tam chocolaty biscuits. These flavorful treats are a lovely combination of crispy Tim Tam biscuit, smooth cream centre and thick chocolaty coating. What’s not to love about chocolate with more chocolate? These biscuits are a cherished Australian export and you can enjoy them here at home from most grocery stores. I hope you’re ready for the final touch…the Tim Tam Slam. 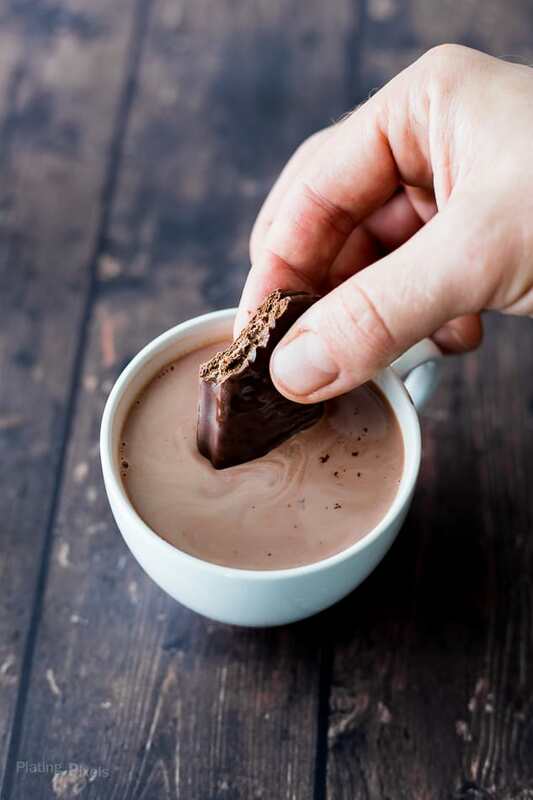 Eat the corners off of opposite ends to create a “straw.” Submerge part of the biscuit into your DIY Hot Chocolate then take a sip through it. The warm homemade hot chocolate slightly melts the center for a gooey treat. Now eat the entire biscuit that’s oozing with flavor. 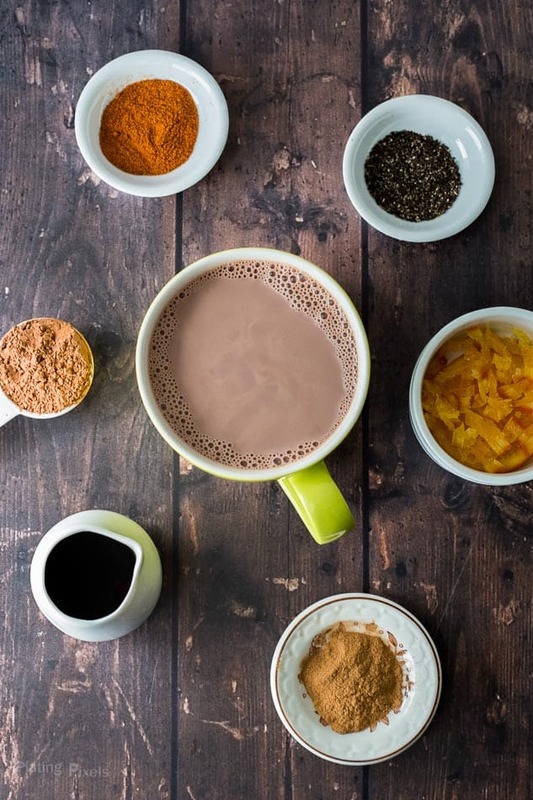 Try DIY Hot Chocolate Mix-ins during your next Friendsgiving. Mine can’t come soon enough and I wish you a fun and flavorful holiday season. 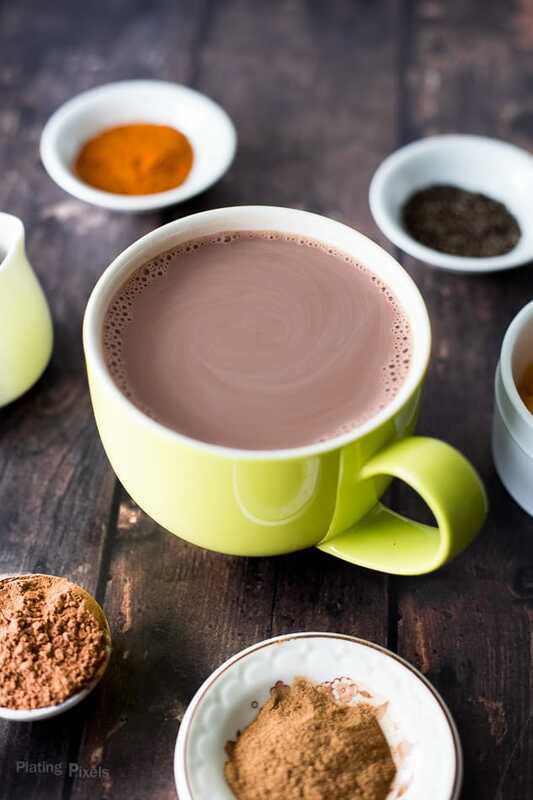 Creamy hot chocolate made with milk, cocoa powder and sugar. Serve with flavor mix-ins and pair with chocolatey biscuits. Whisk together milk/half-and-half, cocoa powder and sugar in a large sauce pan over medium heat (use more or less sugar depending on how sweet you prefer). Stir constantly and heat until warm, but remove before boiling. Pour into mugs and stir in desired amount of mix-ins: candied orange peel, fresh orange zest, candied ginger, vanilla extract, cinnamon, cayenne powder, black pepper, sea salt, caramel, peppermint or almond extract. If anything, you’ve convinced me to look for TimTam at my local Target! Yay for Friendsgiving! I have had too many of those, and am super happy I will be home with my family this year. I love drinking hot chocolate! Thanks for sharing this recipe, looks pretty easy to make and tasty!